An image of the labarum, with the Greek letters Alpha and Omega inscribed. Labarum refers to a military standard used in the Roman Empire that was adapted by the Emperor Constantine I as a symbol of Christianity. He combined the first two Greek letters of the word "Christ" (Greek: ΧΡΙΣΤΟΣ, or Χριστός)—Chi (χ) and Rho (ρ), and ordered his soldiers to place this symbol on their shields before a decisive battle. Constantine's subsequent victory was attributed to Christ's support for displaying the Labarum. As an important symbol of Christianity, the Labarum is one of the many Christograms of Christ. Some Protestant Christians, however, especially Restorationists, reject the use of the Labarum due to what they believe to be its pagan origins, although supporters point out that use of the Labarum was already in widespread use by Christians in the third century C.E., mostly on sarcophagi. Additionally, the "Labarum" was part of ecclesiastical banners in early national Greek flags, blessed by the Greek Orthodox Church. Right-angle labarum, retaining the horizon: Romanesque carving at Santa Maria de Cóll, Vall de Boí, Spain. Various accounts concerning how Emperor Constantine selected the Labarum as a symbol for his Roman Legions exist in Christian lore. According to the historian Lactantius, who was the tutor of Constantine Ι's son, Constantine first viewed the Labarum in a dream, in which he heard a voice saying In hoc signo vinces ("In this sign you shall conquer"). On waking, it is said that he ordered his soldiers to put the emblem on their shields and that very day they fought the forces of Maxentius and won the Battle of the Milvian Bridge (312 C.E. ), outside Rome. However, Eusebius of Caesarea (d. 339 C.E. ), who wrote the first surviving history of the early church, gave two different versions of Constantine's famous vision, which are accepted by the Orthodox Churches. According to Eusebius' Church History, the emperor saw the vision in Gaul on his way to Rome, long before the battle with Maxentius: the phrase as he gives it was "Εν Τούτω, Νίκα! "—literally, "In this, be victorious!" Yet, in a later hagiographic memoir of the emperor that Eusebius wrote after Constantine's death (On the Life of Constantine, ca 337‑339 C.E. ), the miraculous appearance came when the rival armies met at the Milvian Bridge. In this later version, the emperor had been pondering the logical question of misfortunes that befall armies that invoke the help of many different gods, and decided to seek divine aid in the forthcoming battle from the One God. At noon Constantine saw a cross of light imposed over the sun. Attached to it, in Greek characters, was the saying "Εν Τούτω, Νίκα!" Not only Constantine, but the whole army saw the miracle. That night Christ appeared to the emperor in a dream and told him to make a replica of the sign he had seen in the sky, which would be a sure defense in battle. Thus the element of the public miracle is logically reinforced by the account of a private dream of an explanatory nature. Eusebius may have felt that the dream mytheme on its own needed reinforcement supporting his emperor's account, presenting it as a true miracle. He wrote in the Vita that Constantine himself had told him this story "and confirmed it with oaths," late in life "when I was deemed worthy of his acquaintance and company." "Indeed," says Eusebius, "had anyone else told this story, it would not have been easy to accept it." Constantine's modern biographer, Ramsey MacMullen, is one who finds Eusebius' justification not easy to accept: "If the sky writing was witnessed by 40,000 men, the true miracle lies in their unbroken silence about it." There are numerous modern astronomical and astrological theories that defend Eusebius' account as possible. In 1948, Fritz Heiland, of the Zeiss planetarium at Jena, published his astronomical interpretation of Constantine's vision, that the fall of the year 312 C.E. was attended by an unusual spectacle: the syzygy or close alignment of three bright planets—Mars, Saturn and Jupiter—in the evening sky above the southwest horizon, positioned along a line within about 20 degrees of each other on the border of Capricorn and Sagittarius. 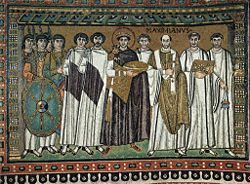 Heiland suggests that Constantine overcame the psychological impact on his army, of the ill pagan content of the astrological omen that associated syzygies with bad outcomes, by appropriating it to fashion a Christian token of victory in the form of the labarum. The Swedish geologist Jens Ormo and co-authors suggest that the account may have had its origins in Constantine's witnessing the daylight effects of a meteorite's descent through earth's atmosphere, of which the impact he believes resulted in the Sirente crater situated in Sirente-Velino Regional Park, Abruzzo, Italy. Though modern representations of the chi-rho sign represent the two lines crossing at ninety degree angles, the early signs of the labarum cross at an angle that is more vividly representative of the chi formed by the solar ecliptic path and the celestial equator. This image is most familiar in Plato's Timaeus, where it is explained that the two bands that form the world soul (anima mundi) cross each other like the letter chi. Regarding Plato's description of the Labarum in Timaeus, Justin Martyr, the Christian apologist writing in the second century, found a prefiguration of the Cross, and an early testimony may be the phrase in Didache, "sign of extension in heaven" (sēmeion ekpetaseōsen ouranō). Not only did the two legs of the chi remind early Christians of the Cross, "it reminded them of the mystery of the pre-existent Christ, the Logos Theou, the Word of God, who extended himself through all thing in order to establish peace and harmony in the universe," in Robert Grigg's words. Hugo Rahner summarized the significance as follows, "The two great circles of the heavens, the equator and the ecliptic, which, by intersecting each other form a sort of recumbent chi and about which the whole dome of the starry heavens swings in a wondrous rhythm, became for the Christian eye a heavenly cross." The shield on the left bears a labarum in this mosaic from the Basilica of San Vitale. Among the many soldiers depicted on the Arch of Constantine, which was erected, largely with fragments from older monuments, just three years after the battle, the labarum does not appear. A grand opportunity for just the kind of political propaganda that the Arch otherwise was expressly built to present, was missed, if Eusebius' oath-confirmed account can be trusted, although it can be argued that, in the early years after the battle, the emperor still had not decided to give clear public support to Christianity, whether for lack of personal faith or in fear of religious friction. The arch's inscription does say that the Emperor had saved the res publica INSTINCTV DIVINITATIS MENTIS MAGNITVDINE ("by greatness of mind and by instinct [or impulse] of divinity"). As with his predecessors, the sun symbol—interpreted as Sol Invictus (the Invincible Sun) or also as Apollo or Mithras—is inscribed on his coinage, but in 325 and thereafter the coinage ceases to be explicitly pagan, and Sol Invictus disappears. In his Historia Ecclesiae, Eusebius further reports that, after his victorious entry into Rome, Constantine had a statue of himself erected, "holding the sign of the Savior [the cross] in his right hand." There are no other reports to confirm such a monument. Whether Constantine I was the first Christian emperor supporting during his rule a peaceful transition to Christianity or an undecided pagan believer until middle age, strongly influenced in his political-religious decisions by his Christian mother St. Helena is still in dispute among historians. He is celebrated together with his mother St. Helena as Equal-to-apostles (isapostoloi) on 21 May by both the Eastern Orthodox Church and Oriental Orthodoxy as a saint of Christianity. However, the Latin Roman Catholic Church, while celebrating Helena of Constantinople as a saint, has never placed Constantine among the saints, and has been content with naming him "the Great," in grateful remembrance of his services to the cause of Christian civilization. Nevertheless, Emperor Constantine definitely bestowed imperial favor on Christianity by returning and legally protecting property taken from the early church. He offered legal protection of the freedom of confession to all religions within the Empire, with the famous Edict of Milan in 313 C.E. and not only "toleration of other religions as indulgence" as Galerius did in 311 C.E. Constantine I was the first to declare (March 7, 321 C.E.) dies Solis (Day of the Sun, Sunday) as the day of rest throughout the Empire. He declared Rome a Christian city and allegedly placed his mother in charge of locating Christian relics, resulting in the alleged discovery of the True Cross in the Holy Land. A small portion of the relics that she located (together with the Nails), two of which she later gave to her son Constantine for protection, together with soil from the True Cross excavation site and big parts of the Cross itself were then stored in a room inside her palace in Rome around which the basilica of Santa Croce in Gerusalemme, housing the Passion relics, was built (also named St. Helena's chapel). It was later (fifteenth century) converted into the Abbey of Santa Croce. The famous relics, whose authenticity is disputed, are now housed in a chapel (the Cappella delle Reliquie), built in 1930 by architect Florestano di Fausto. They also include: a part of the Elogium or Titulus Crucis, i.e. the panel which was hanged to the Christ's Cross; two thorns of his crown; the third nail (incomplete); and three small wooden pieces of the True Cross itself. A much larger piece of the holy cross was brought from Santa Croce in Gerusalemme to St. Peter's Basilica on instruction of Pope Urban VIII in the year 1629. It is kept near the statue of St. Helena, made by Andrea Bolgi in 1639. Coin of Magnentius with large Chi-Rho at ecliptic angles. 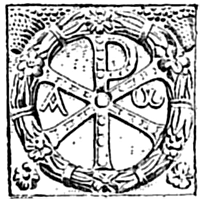 Although Emperor Constantine is credited with first having used the Chi-rho symbol, scholars suggest that the actual date for the use of the Labarum is much later than mythological accounts. The self-proclaimed Emperor Magnentius (303-353 C.E.) appears to have been the first to use the chi-rho monogram flanked by Alpha and Omega, on the reverse of some coins minted in 353 C.E. In Roman Britannia, a tessellated mosaic pavement was uncovered at Hinton St Mary, Dorset, in 1963. On stylistic grounds it is dated to the fourth century; its central roundel represents a beardless male head and bust draped in a pallium in front of the chi-rho symbol, flanked by pomegranates, symbols of eternal life. ↑ Lactantius, On the Deaths of the Persecutors, chapter 44. ↑ Ramsey MacMullen, Constantine (Weidenfeld, 1970). ↑ David J. Ross, Culture and Cosmos Vol. 4, No.2 (Autumn/Winter 2000). ↑ Heiland, “Die astronomische Deutung der Vision Kaiser Konstantins,” in Sondervortrag im Zeiss-Planatarium-Jena (1948), 11-19. ↑ BBC NEWS, Science/Nature, "Space impact 'saved Christianity'" Retrieved August 9, 2008. ↑ Plato, Timaeus 8.36b and c.
↑ 8.0 8.1 8.2 Robert Grigg, "Symphōnian Aeidō tēs Basileias: An Image of Imperial Harmony on the Base of the Column of Arcadius," in The Art Bulletin 59.4 (December 1977), 477, note 42. ↑ W. Kellner, Libertas und Christogramm (Karlsruhe, 1968), 57ff; noted in Grigg (1977), 469 note 4. Grigg, Robert. "Symphōnian Aeidō tēs Basileias: An Image of Imperial Harmony on the Base of the Column of Arcadius." In The Art Bulletin 59.4. Dec. 1977, 469-482. Paap, A. H. R. E. Nomina Sacra in the Greek Papyri of the First Five Centuries. Papyrologica Lugduno-Batava VIII Leiden, 1959. This page was last modified on 4 September 2008, at 20:48.